In the years 1947-1980, the average hourly earnings of production workers rose 6.08% annually while the CPI grew 4.03% (Source) In effect, earnings rose 2% higher than prices. 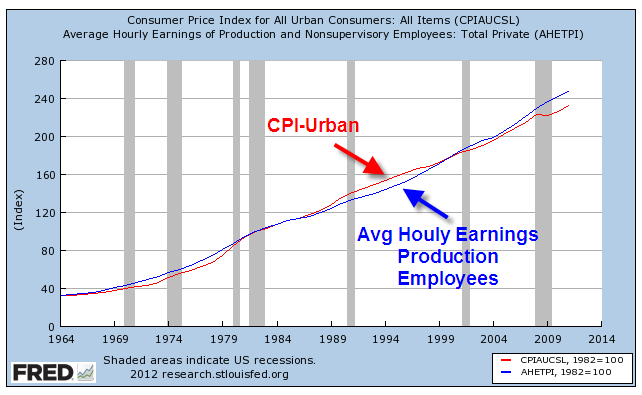 Since 1980, earnings have risen 3.55% annually as the CPI rose 3.29%, giving workers a real growth rate of less that a 1/3rd of 1%. The rise in worker productivity fueled gains in worker compensation until the past fifteen years. 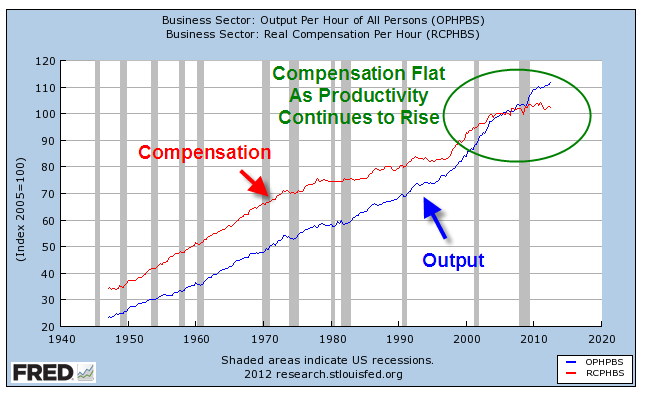 Below is a chart of real, that is inflation-adjusted, compensation and productivity. Increased Productivity means more profits. For several decades in the post-WW2 economy, workers shared in those profits. After the recession of 1982-1984, workers’ share of the increase in output slowly decreased. As incomes barely kept up with inflation, workers tapped the equity in their houses. Low interest rates, poor underwriting standards, lax regulations and a feeding frenzy by both home buyers and banks fueled a binge in home prices, followed by the hangover that started in 2007. 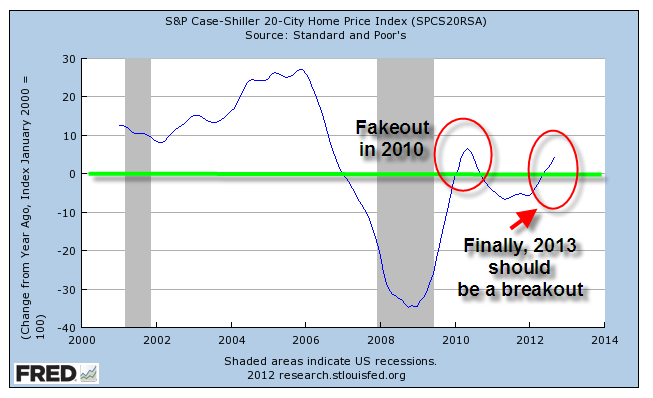 Only now is the housing market struggling up out of a torpor that has lasted for several years. Before the housing bust, magical thinking led many to believe that the rise in home equity was a sure fire way to riches. Over a century’s worth of data shows that housing prices tend to rise about the same as the CPI. 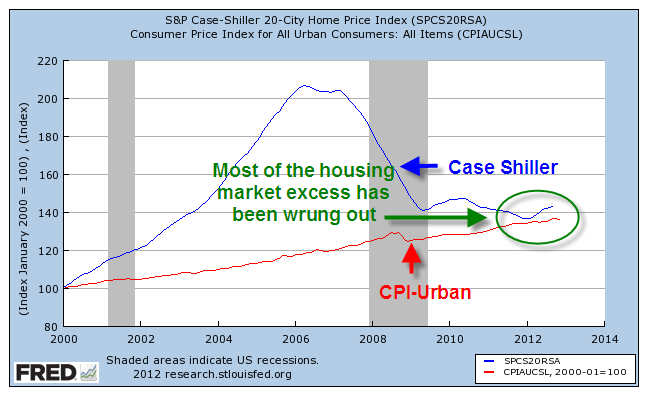 Housing prices have finally bottomed out at about the same level as the long term trend line of CPI growth. The boom and bust upended the lives of a lot of people and the repercussions of that “hump” will continue as banks continue to foreclose on home owners whose incomes have flattened or declined. The recovery in the housing market will help some home owners but the real problem is unemployment, underemployment and the decreasing share of workers’ share of the profits from productivity gains. Until the labor market heals, the housing market will not fully heal. Those who do have savings have become cautious. Since 2006, investors have taken $572 billion out of stocks and put $767 billion in bonds, a move to safety – or so many retail investors think. 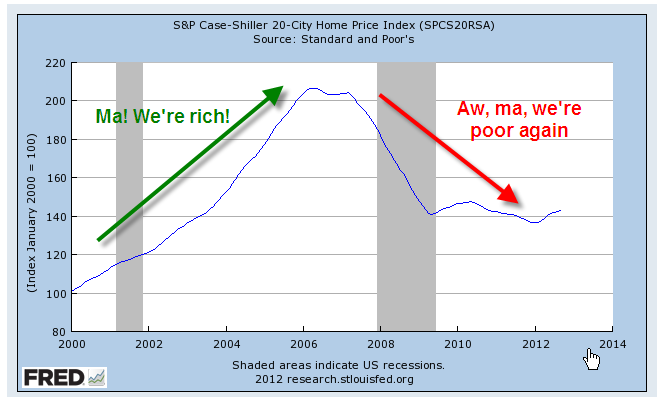 For decades, home prices never fell – until they did. For over thirty years, bond prices have been rising, giving many retail investors the feeling that bonds are safe – until they are not. Companies have been selling record amounts of corporate bonds into this cheap – for companies – bond market. As this three decade long upward trend in bond prices begins to turn, bond prices can fall sharply as investors turn from bonds to stocks and other investments. 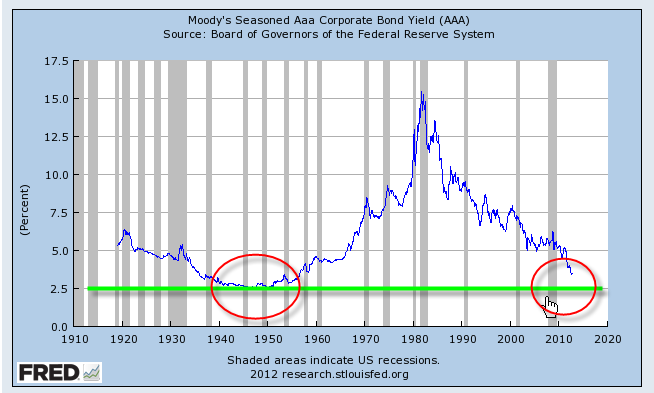 We are approaching the lows of interest yields on corporate bonds not seen since WW2. Investors are loaning companies money at record low rates and companies are sucking up all that they can while they can. Sounds a lot like home buying in the middle of the last decade, doesn’t it? Y’all be careful out there, ya hear?